What are some other Thanksgiving guilty pleasures? In a large sauce pan , saute 3/4 cup mushrooms, onions and olive oil. 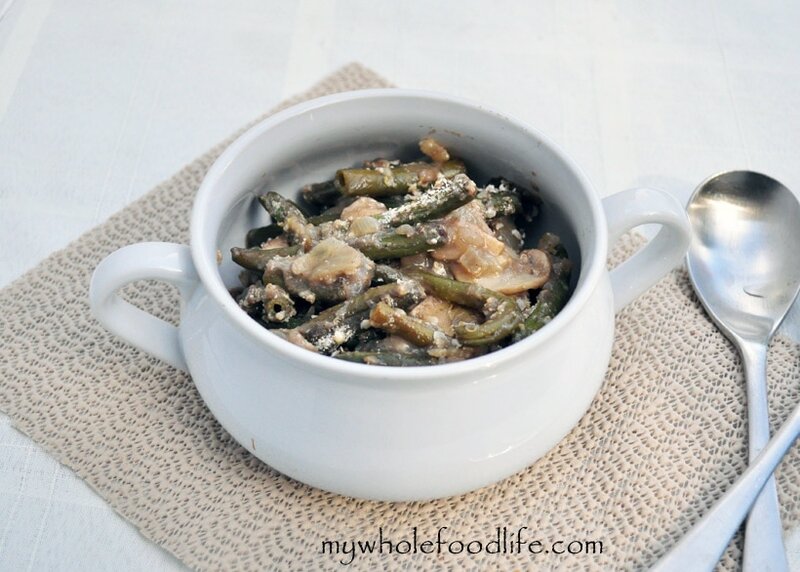 In another pot, boil the green beans in the 3 cups veggie broth for 10 minutes. In a food processor , combine the arrowroot, 1/4 cup milk and 4-5 sliced mushrooms until mixture is fully pureed. Once the beans are boiled, drain and add them to the mushroom/onion mixture. Add the pureed mushrooms to the pan. Now add the salt and breadcrumbs. Stir well. Pull it out and sprinkle last 2T breadcrumbs over the top and cook for another 5 minutes. Candied Yams, mashed potatoes & gravy, cranberry sauce, stuffing, dinner rolls. Those are the staples of our Thanksgiving meal anyways. What did Marcus think of the green bean casserole? I'm guessing since its posted, he liked it. Made this for a party and it was a huge hit! Wasn't pretty to look at but tasted sooooo good! Yes I was considering posting a link not the whole recipe. Thank you.